Fires close sections of Blue Mountains National Park from time to time, and tracks may be closed for maintenance or safety reasons. Check the current closure status with NPWS BEFORE you head out. As a kid I rode Malvern Stars and dragsters around the streets of Blaxland and hit the trails on a lawn mower engined mini bike. Nowadays, I'm still in the Blue Mountains, and do my trail riding on mountain bikes - there are some great trails locally (some with spectacular views), and some big hills to struggle up, but big hills are great fun going back down - surely the only reason uphills exist. Rides are rated in fat hippies - one fat hippy means grab a slice of pizza, sit on your beanbag, and stare at the lava lamp, two means not bad, three means well worth a ride, four is a great ride and five means stop looking at your computer, go ride it - now! A new category of no fat hippy means the track should be avoided - it's a climb, a walk, or just lame. All opinions and times taken are based on my own experiences - yours might be different. To put my reviews into some sort of perspective, here's some info about me. These are just some of the rides I reckon are pretty good, and were ridden between 1999 and 2013. 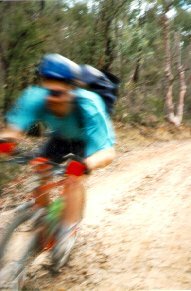 In the mid-noughties, The Oaks and St Helena were voted as NSW's most popular mtb rides by Australian Mountain Bike readers - which probably made them the most popular in Australia. If you explore, no doubt you'll find more great tracks. Any reasonable quality mtb in good condition will take you safely on all these rides - you don't need the latest and greatest, although you will need good brakes! You should avoid supermarket bikes with "Not suitable for off road riding, stunting or jumping" stickers - they really aren't... Buy from a bike shop, and tell them the sort of riding you plan on doing, so they can point you at the right models. Speak to a few shops. While suspension isn't essential for any of these rides, I strongly recommend front suspension for the improvements in control and comfort you'll receive. In fact, I reckon duallies are better still, the advantages outweighing the disadvantages of complexity and weight. I don't recommend supermarket duallies at all. Note that tracks and National Parks may be closed as a result of bushfires, extremely high fire danger, or for other reasons. 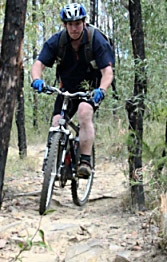 Check with NPWS before riding - no matter what I've written, tracks may be closed. High winds around September and October tend to bring a lot of trees down - take care! Grose Head South - Winmalee - great views of the Grose Valley. + None at the moment! The Victory Track - from Faulconbridge to Springwood. I'm often asked about bike hire. There are very limited options available in the Blue Mountains - as far as I can tell, no-one rents out high end bikes, or even cheaper duallies. a typical rental bike is a basic hardtail - front suspension, 21 gears, disc brakes. Blue Mountain Bikes runs out of Woodford's Transit Coffee and has Trek hardtails for hire. And of course, coffee! Woodford's a good spot to start - there are a number of popular trails starting or finishing in Woodford, and many other trails within half an hour by train. Don't forget that weather conditions in the mountains - and particularly the upper mountains - can change rapidly (especially in summer), and may be different to the plains. Be prepared. 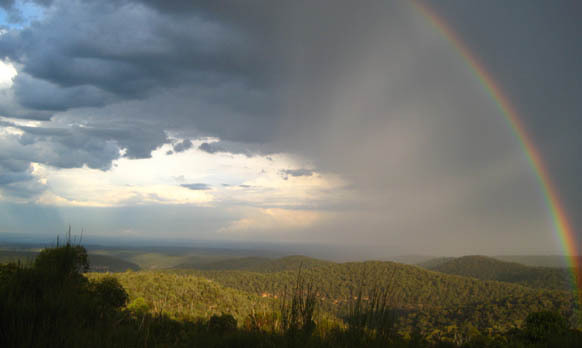 Blue Mountains City Council provides access to local Katoomba and Springwood weather - and a lightning detector. There are also unofficial weather stations at Blaxland and Woodford. Don't drink the water! Years of septic run off and sewage overflow means you shouldn't drink from Blue Mountains creeks. If you drink from a creek, boil your water, or use decontamination tablets. Carry a spare tube (better still, two tubes), pump, puncture repair kit, tools and a first aid kit - especially if going into remote areas. I've needed all of these more than once. Pinchflats are common. Mobile phones often can't receive a signal when you're offroad in the mountains. Ambulance cover is an official GOOD thing! MTB riding can result in serious injury and we may be riding in remote locations - if the injury doesn't kill you, the ambulance bill might!! See a private health fund for cover - even if you don't want health insurance, get ambulance cover. Spring means wildflowers, slow down and sniff the boronia in October/November. Summer can be damn hot - use sunscreen, take plenty of water. and don't light fires. World Heritage listed National Park - enjoy but respect the environment! Unless otherwise stated, all text, images, thoughts, comments, opinions, etc, expressed herein are mine, and should not be taken to represent those of anyone else. If you don't like anything I've said, go elsewhere. No one is forced to stay.